After 17 hours of gruelling play, Matthew Ephraums has emerged the victor over Brendan Edmonds, taking home the lion's share of the prize pool and the coveted championship gold ring. Ephraums will also go down in history of conquering the largest Australian championship poker tournament field in history - a remarkable achievement for him and for Crown Casino, which shows just how much their hard work and dedication to the game is being rewarded. Congratulations Matthew, your win is thoroughly deserved and also kudos to Brendan for your efforts - we hope to see you both back in the Crown Poker Room soon. Of course, it goes without saying that this is the end of the event - we hope you enjoyed our coverage - but we've got plenty more action coming your way! Be sure to keep your browser logged onto PokerNews as we bring you live updates from Event #3: AUD $1,100 Limit Hold'em event from 12.30pm AEDST. See you then! Brendan Edmonds Eliminated in 2nd Place ($142,875); Matthew Ephraums Wins! We were expecting a long, arduous battle but it was all over just after 5.45am - Brendan Edmonds raised to 300,000 from the button, Matthew Ephraums reraised to 1 million straight, Edmonds announced he was all in and Ephraums snap-called. Ephraums soared further ahead when the flop came down . Drawing thin to runners, the turn was red but not what Edmonds was looking for as it was in the . 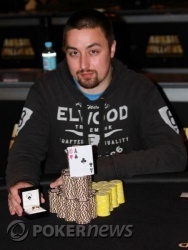 It was all over before the river completed the board - Edmonds bows out in second place, confirming Matthew Ephraums as our second Aussie Millions Poker Championship winner in 2010! After Edmonds took over the chip lead, a crucial point just played out. Ephraums fired out 400,000 on a flop and Edmonds made the call. On the turn, Ephraums bet 600,000 and Edmonds called again. The river was the and Ephraums bet 500,000 to which Edmonds moved all-in. Ephraums made the call with , no heart in his hand but Edmonds could only show for a second pair turned into a bluff. Edmonds is down to 2,635,000. Ephraums has the rest. Brendan Edmonds raised to 200,000 and Brent Thomas moved all-in for 1,350,000. Edmonds quickly called. And after nearly 15 hours of play, we're now heads up here in the Crown Casino! 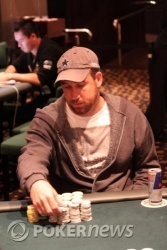 A limped pot between Brent Thomas and Brendan Edmonds saw a flop of . Edmonds check-called a bet of 150,000 before check-raising Thomas' turn bet of 150,000 to 500,000 when the appeared. Thomas made the call and the river was the . Edmonds now moved in for around 1,535,000 and Thomas called. 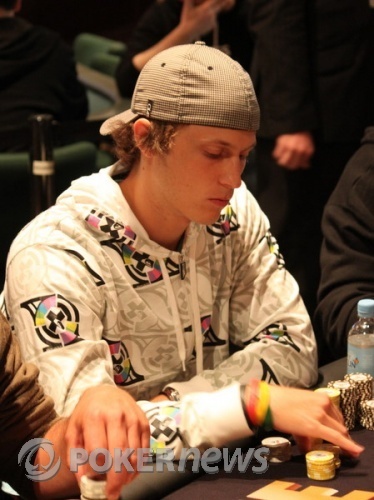 Edmonds doubles up to nearly 5 million and Thomas is crippled.